Super soft stuffed fox from First & Main. First & Main TENDER TEDDY 11in Fuzzy Cream Plush Bear Cute 11in tall fuzzy cream plush named Tender Teddy. He's in nice pre-owned condition; "cutie" Is written the tush tag. My home is SMOKE FREE and PET OCCUPIED but I cannot speak for where these items have been before. I try to describe items to the best of my ability but am no expert and condition is sometimes a matter of opinion. Any issues will be noted in descriptions. I clean and test all toys to make sure they work satisfactorily. Batteries are not included. Check out my other listings! Material: Plush, polyester fiber, plastic pellets. Clean beautiful plush with nice colors. Year: 2010. Condition: Clean and Nice! Dog is New. If you need larger quantities than what we have listed. Let us know and we will try to accommodate you. 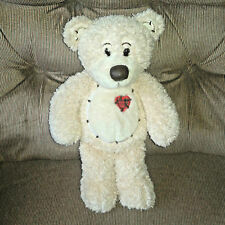 New ListingFirst & Main white teady bear 13"
IT IS SEWN AND DESIGN TO SIT AND NOT STAND. 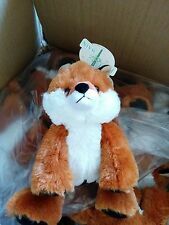 IT HAS A RIBBON AROUND THE NECK AND A LACE DESIGN ON THE PAWS. SHE IS IN GOOD PLAYED WITH CONDITION WITH NORMAL SHELF AND LIGHT PLAY WEAR. I can make no promises, but I do try. First & Main Sherbet Baby Orange Bear Plush #1625 Sits 9" - great played with condition, light play wear. Disney Tinkerbell Fairy Doll 5" - great pre-owned condition, light play wear from play/handling. First & Main BUMPKIN Plush Bear Stuffed Animal 10"
May need cleaning from storage. First and Main - Blackie Teddy. Review pictures carefully to be sure the item is right for you. I am happy to provide answers! Prayer bear. Brown Teddy Bear. Plush Animal. First and Main. FIRST & MAIN 16" Brown Minkey with belly button. Perfect for any boy / girl. From a little toddler up to a full grown adult. Style:Brown Bear. Give us a shot and we will make sure that you will look to us again! You're already purchasing the item. Characters: Nubby babies. Type: elephant rattle plush. Color: pink, yellow, blue soft toy stuffed animal plush. Condition: Good condition. Type of toy: Plush. ------------------------------- cute plush shows gentle wear from play. I treat others the way I want to be treated. Communication is vital, as is honesty and integrity. 17" Tall from head to toe laying flat. Good used condition with normal wear. He has a red, blue and yellow plaid ribbon tied around his neck. He has black colored accents on his nose and feet. Mac Sr. is brown in color. He has tan colored accents on his feet. 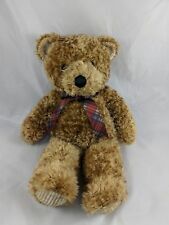 FIRST AND MAIN SOFT AND PLUSH #1796 DEAN TEDDY BEAR. IN GOOD PRE OWNED CONDITION. UPC: 812842022177. Pink And Main Dies Stitched Rounded Rectangles, 8/Pkg. Master Card. International Standard. Pristine clean condition with no damage of any kind. Please see pictures and feel free to ask questions. First Main KIT KAT Cat Orange Tabby Tiger Kitty Kitten 8" Plush Stuffed Animal . Condition is Used. Shipped with USPS First Class Package. Jag Dog 7" Red Stuffed Animal by First & Main. stuffed animals. Stuffed animals that have ageless appeal, soft, adorable and affordable! First & Main was founded in 1994 starting out with just a few product styles mostly plush teddy bears. 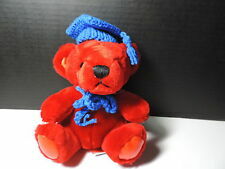 FIRST & MAIN blue brown BLUE BEARY TEDDY BEAR W/ POLKA DOT BOW. Blue Beary is blue in color. He has a brown and blue polka dot colored bow tied around his neck. He has brown colored accents on his ears, nose, hands and feet. First & Main Plush Wise Owl Stuffed Animal Lovey Glasses 14"
This Plush is in nice played with condition. First & Main Plush Brown Fluffies Teddy Bear Soft Stuffed Toy Stitched Eyes 15"
First & Main Fluffies Brown Bear. Brown with tan face, ears and feet. Stitched eyes and adorable smile. All items I sell come from my smoke-free home and pet-free area, and all non-new items are inspected and cleaned before listing, unless otherwise noted. Please zoom in on all photos to ensure confidence in your purchase. I ship daily... please check out my feedback and be sure to visit my store!. Heart shaped sewn nose. 10" head to heels. Head turned left. First & Main Black Cream Cat Catnip Plush Soft Toy Stuffed 1002A 12"